Craig Mastantuono published an op-ed piece on Urban Milwaukee this week, which also appears below. I’m a Milwaukee criminal defense lawyer and, this week, a delegate to the Democratic National Convention (DNC) in Philadelphia. The day before I left for the convention, I was in court defending a non-violent drug offender in Waukesha County who a prosecutor was trying to send to prison. Given what I do, I’m obviously interested in the debate around criminal justice reform at this convention and in this presidential election, so I’ve come here seeking to learn anything I can. “I will be the Law & Order president” said Donald Trump at his Republican National Convention (RNC) speech. What does that mean? What does a law and order President do to get more lawful and more orderly in a country that is already really good at incarcerating people? The U.S. has 5 percent of the world’s population, but 25 percent of its prisoners; our prisons alone cost over $800 billion a year. In politics, if you don’t tout law and order does it mean you’re the candidate who wants lawlessness and disorder? On the other side, Hillary Clinton wants to reform criminal justice and end mass incarceration. What does that mean? Do we let people out of prison? Send less people to prison? If so, who gets out, or who doesn’t go? How do we actually end mass incarceration? These are just some of the questions I have as I move about as a delegate this week. As a defense attorney, I’m happy that reform in criminal justice is being debated; I’ve been practicing since the early 1990’s, when getting tough on crime was generally seen as the only politically smart move. But now that the pendulum seems to be shifting the other way, as a daily practitioner in criminal courts I’m eager to scratch the surface behind the terminology being thrown around in the debate. 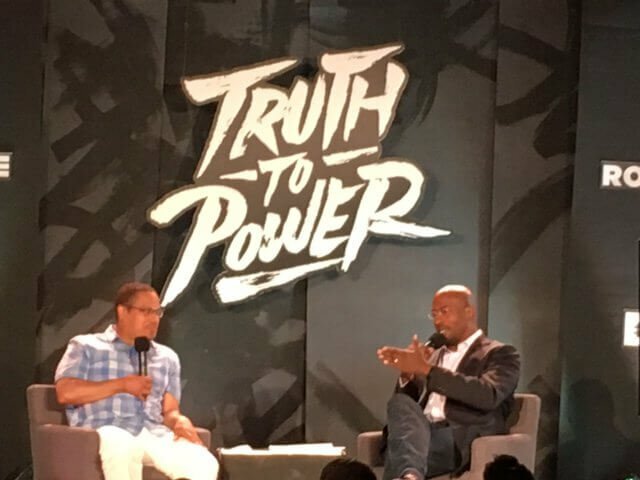 On Tuesday, I attended an art exhibit and panel discussion led by CNN contributor Van Jones, formerly of the Obama White House. Jones led Sen. Cory Booker, Rep. Keith Ellison and others through a discussion of criminal justice reform. My takeaway? The art dug just as deep as the speakers in trying to get beneath the rhetoric to actual solutions. The reality is that local criminal justice jurisdictions – not the federal system – still control the bulk of police citizen encounters, and who goes to jail or prison. Sen. Cory Booker and Van Jones. Photo by Craig Mastantuono. If you look comparatively at the DNC/RNC party platforms, they certainly are different: one looks backward, and one looks forward. Examples: the RNC platform supports the death penalty, criticizes the Justice Department for its hand-off approach to states that have legalized marijuana, and supports certain mandatory minimum sentences. The DNC platform opposes the death penalty, supports removing marijuana from the list of schedule-one controlled substances, and generally opposes mandatory minimum sentences in favor of prevention and rehabilitation over incarceration. When combined with Trump’s invocation of a law and order presidency, my take on the GOP approach is that it’s just another page out of the old political playbook on crime: “be afraid, very afraid.” On the Dem side, the platform and Clinton’s public statements on criminal justice reform and ending mass incarceration are more progressive on these issues than any previous platform or candidate I can recall. Clinton is hoping the more current “let’s get smart on crime” approach wins with voters. 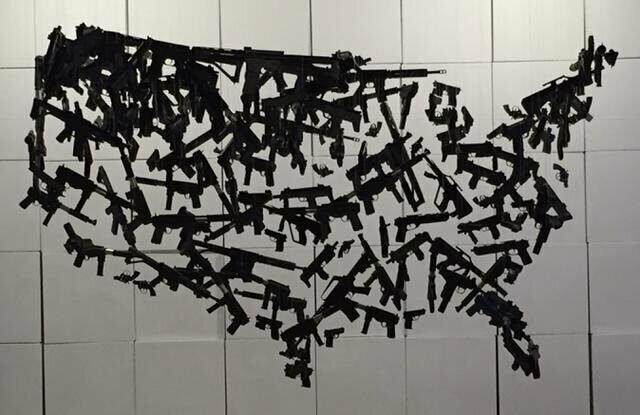 Hanging sculpture of guns from another angle. Photo by Craig Mastantuono. Locally, what happens in criminal justice affects us all as taxpayers. We are spending huge amounts of money in Wisconsin incarcerating people. Overuse of felony convictions and incarceration are taking up untold human resources, producing people who want to work but can’t find jobs, and splitting up families. The Wisconsin Department of Corrections budget is out of control, largely driven by 1990’s era truth-in-sentencing legislation pushed by then-State Rep. Scott Walker (among many others), and by an unwillingness to address any criminal justice reforms in Madison. The pipeline to jail and prison is also fed by the thousands of decisions prosecutors and judges make each day in criminal cases. Who gets arrested, who gets charged, who gets a plea deal or a felony conviction, and who goes to jail or goes home are all driven to a high degree by law enforcement and prosecutors, with a subjective element, meaning people decide these things, and they bring all of their human emotions and biases with them in the process. So the rubber really meets the road locally in each case, and what happens in each case creates the larger number of people we lock up or don't lock up, the dollars we spend, and how we spend them. In Milwaukee County, District Attorney John Chisholm has put in place policies to divert and defer non-violent criminal offenders from traditional prosecution. The Milwaukee model instead requires treatment for underlying problems like drug addiction or mental illness while holding people who commit crimes accountable, and saving thousands of people from incarceration or a permanent felony conviction. Our leaders either affect change locally within their own jurisdictions, or they don’t. DA Chisholm has affected change in Milwaukee County. And that non-violent drug offender who stood next to me last week in Waukesha? My young client avoided the prison sentence pushed by the prosecutor, with the judge instead opting for our recommendation of probation and local jail. That decision avoided approximately $64,000 in taxpayer costs had the young man been sent to prison (at $32,000 per year in Wisconsin), and it will keep him connected to his community while he pays his debt to society. As the criminal justice reform debate moves forward this presidential campaign season, each side will tell you its position about public safety, punishment, retribution and redemption, about what lives matter, and about who should or shouldn’t be locked up. People have strong opinions about these things, but how they are reflected in local criminal justice policy varies, and even the national platforms and presidential candidate positions are largely general, lacking specifics on how to accomplish goals at the local level. In the end, the tone and tenor of the candidates and ultimately the next president will filter to the local level, providing resources and political incentives to put policies in place in one direction or the other. And with Trump now looking more like Nixon ’72 or Bush ’88 on crime, and Clinton looking for criminal justice reform, the public will have a clear choice on the issue in November.